So, the world and his wife are pretty much in agreement about THAT penalty! It never was and should never have been…unless your name’s Mark Clattenburg. 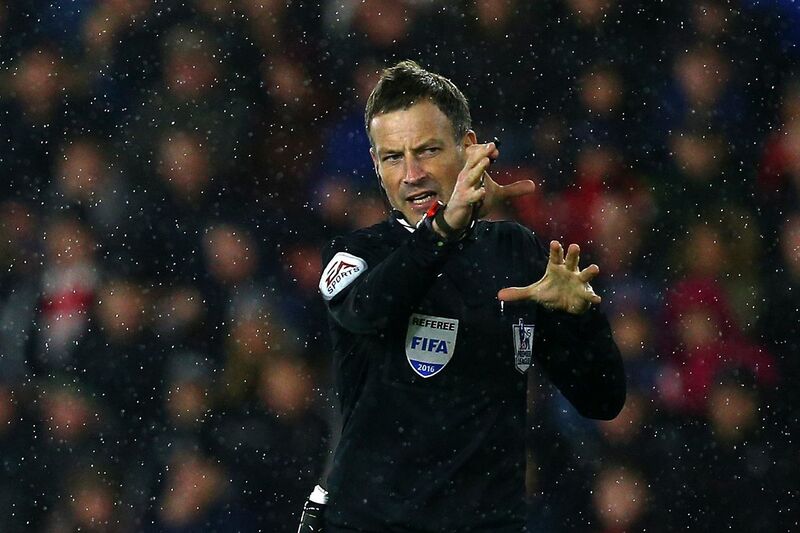 Curse of Clattenburg – Twattenburg was at it again at the Etihad. Even by Twattenburg’s appalling standards when officiating City games, penalising Raheem Sterling was breathtakingly bad. It begs a question or two of this most arrogant of referees…is he inept or a cheat? Is he hopeless or corrupt or, as some would have us believe, is he one of the most gifted officials of his generation, bursting with integrity? FIFA certainly seem to think the latter – so that’s a glowing endorsement isn’t it? The cross from Tottenham’s Danny Rose struck Sterling’s back – it’s debatable if it even deflected onto his arm – but if it did, it clearly was NOT deliberate. Handball – even under the rules amended by the International Football Association Board in 2013 – has to be a deliberate act. Former referees Graham Poll and Dermot Gallagher have both had their say in the media, deploring the awarding of the penalty. 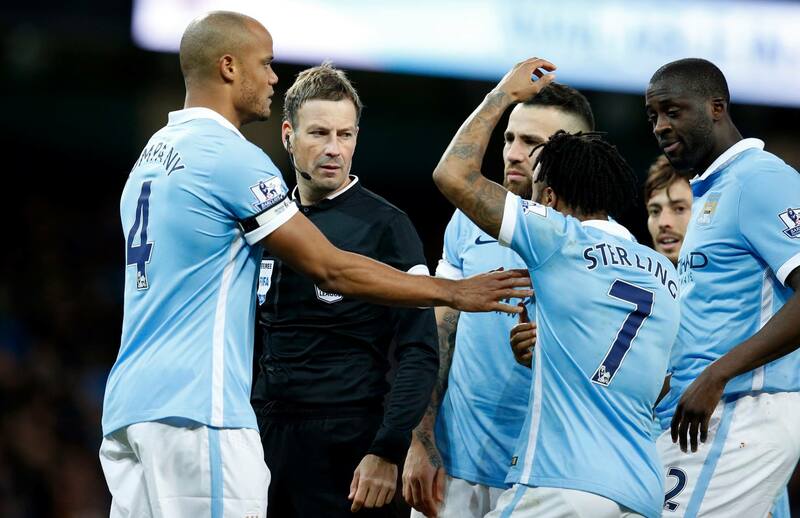 Gobsmacked – City’s players cannot believe Clattenburg’s penalty decision. Even the usual posse of poisonous pundits e.g. 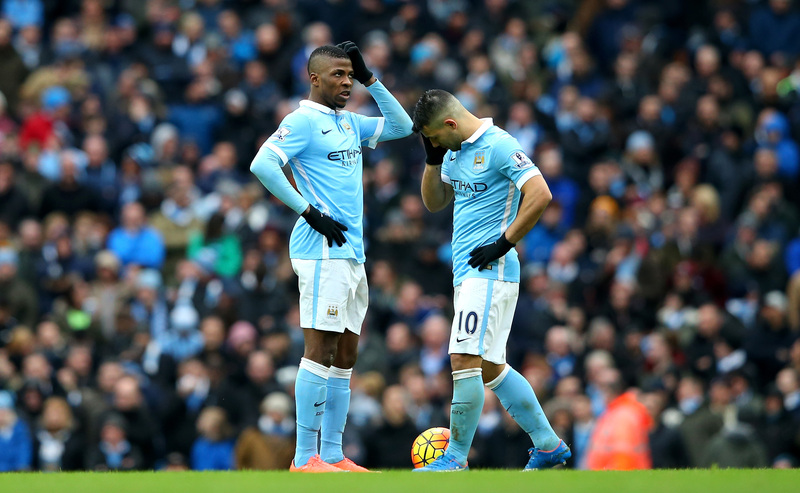 Stan Collymore, Robbie Savage and the especially noxious, Niall Quinn, had to concede City had been wronged. If Twattenburg interprets Sterling’s act as deliberate then he is two of the aforementioned options – a cheat or a complete chump who is not fit to referee. Manuel Pellegrini – never one to court controversy – highlighted the fact that Twattenburg and his sidekick assistants had managed to engineer three goals for Spurs against City this season. Kane conversion – Spurs go one up with the penalty that should never have been awarded. Two blatant offsides at White Hart Lane in September, and the farcical penalty at the Etihad, which Harry Kane duly converted. Clearly Twattenburg’s linesman didn’t know the difference between offside and his own backside, as Sergio Aguero was incorrectly flagged on several occasions. But – and it’s a big but – notwithstanding Twattenburg’s antics, City were once again found wanting against another of their top four rivals. Deservedly beaten 3-1 by Leicester just nine days beforehand, City came up short against a hardworking, energetic and direct Spurs, perfectly marshalled by a superb manager in Mauricio Pochettino. Ironically it was the blatant injustice of Kane’s 53rd minute penalty that roused Pellegrini’s side from comparative lethargy. It’s a question asked by City supporters time and time and time again – why does their team have to be ‘provoked’ before attempting to make a match of it? 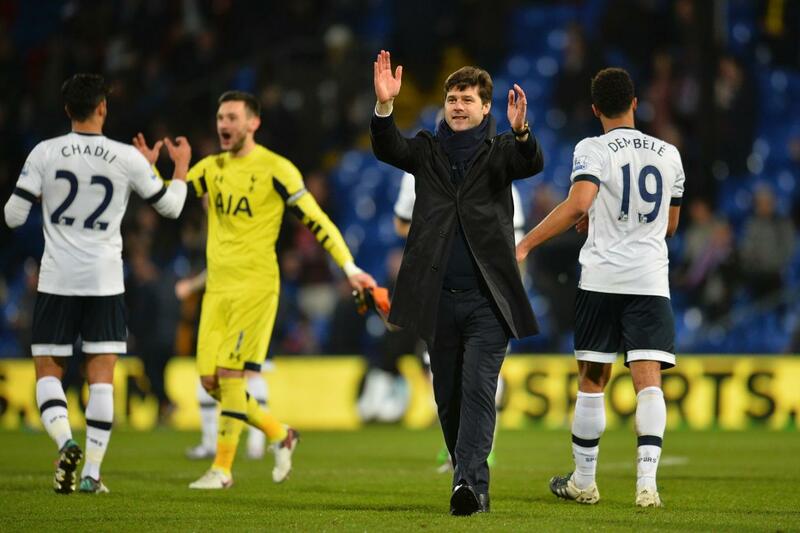 Happy Clapper – Pochettino shows his delight at the Etihad victory. Infuriating and frustrating, City either cannot, or will not, put in a decent shift to win games against opponents who adopt a high tempo. Are they are simply not up to it? Does their physical conditioning let them down? Are they mentally incapable of fulfilling the terrace battle cry of ‘fighting ‘till the end’? Far too often City have failed to fight from the start, leaving themselves chasing lost causes as the clock ticks down to the final whistle. It’s all well and good getting pumped up in the face of adversity, but where’s the desire, the hunger and the work ethic when the kick-off comes around? Yes, the injury list is extensive and well chronicled, but that cannot be an excuse week in and week out. Pellegrini speaks of only having 14 senior players available for weeks on end. In which case why did City start the season with a ‘senior’ squad of just 21 (including 3rd string goalkeeper Richard Wright) instead of the 25 players allowed? Sterling and Iheanacho weren’t included as they were under the 21-year old threshold at the start of the season, so is it a case of ‘fail to plan’ ‘plan to fail’? A lamentable record of taking just 1 point from 15 against the top three of Leicester, Spurs and Arsenal is pathetic for a team of City’s stature and ambition. Thankfully, rumours of Pep Guardiola having an escape clause in his contract if City fail to finish in the top four of the Premier League, are ill-founded and mischievous – but it’s just as well. The gut churning Valentine’s Day loss was another collective failure. It might be heresy to mumble it, but even the untouchables of Aguero and Silva chronically underperformed, along with the usual suspects. On a day of few positives, Captain Vincent Kompany came through the full 90 minutes intact and Kelechi Iheanacho smashed home his ninth goal in his debut season. It’s now 16 days before the next league fixture at Anfield, 36 points remain up for grabs and, according to Kompany, a third Premier League title is still far from lost. 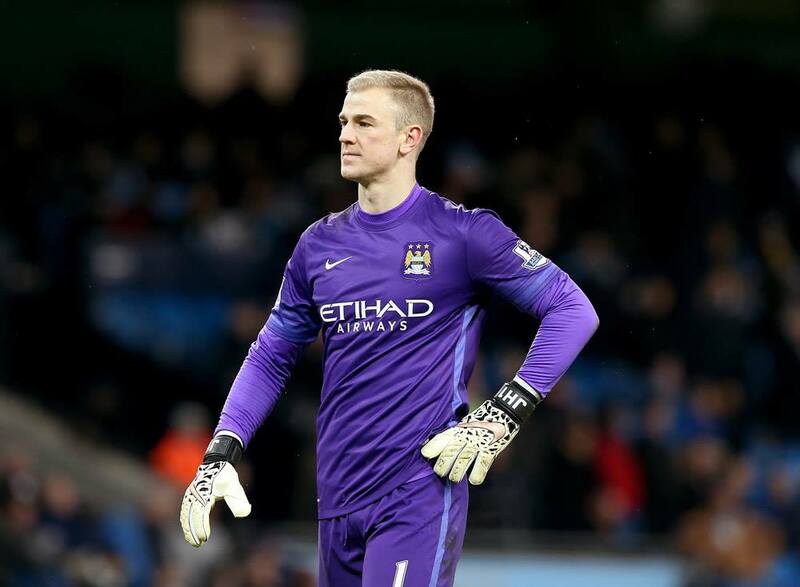 The return of the charismatic and commanding skipper could yet be the catalyst to finally get City’s campaign going. 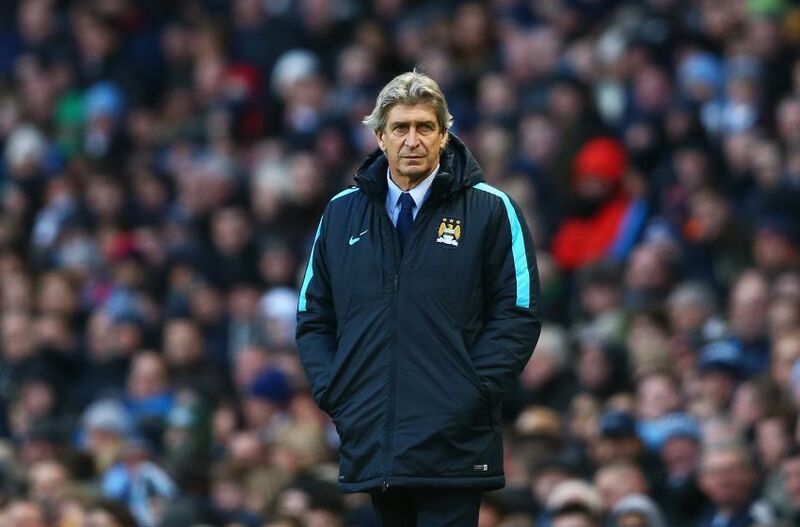 He said City would be ‘stupid to forget their history’ adding ‘…there is not a chance we will give up on the title’. Valentine’s Day Disaster – Eriksen hits the winning goal for Spurs on his birthday! One can only hope Kompany’s words have more substance than the lame mutterings of other players in recent times. It will require a seismic shift in mental and physical application, from a forlorn squad and a departing manager, but it can be done. The worrying difference between 2016 and the successful title run ins of 2012 and 2014, is that City have never hit a consistent ‘purple patch’ of form, apart from the opening few games in August and September. City’s odds to win the title have drifted out to as high as 7/1, so if Mission Improbable becomes Mission Accomplished by May 15th any fan who takes a punt can dine out in style, while ramming humble pie down the throats of the legion of City haters. By contrast, the odds on a second half Spurs penalty at the Etihad have yet to be revealed by any betting syndicates in Kuala Lumpur, Jakarta or Singapore! Next up is a triple header of tough cup ties against a resurgent Chelsea, a difficult Dinamo Kiev and a Wembley date with Liverpool. As the fixtures come thick and fast, Pellegrini needs to prioritise his competitions and take a roll call on the fit and walking wounded in his squad. If you rewind just a few short years ago to a ‘norm’ of League Cup 2nd Round exits, FA Cup 3rd Round debacles, non-existent European games and a mantra of ‘let’s concentrate on the league/try and avoid relegation’, it’s surely a welcome dilemma. 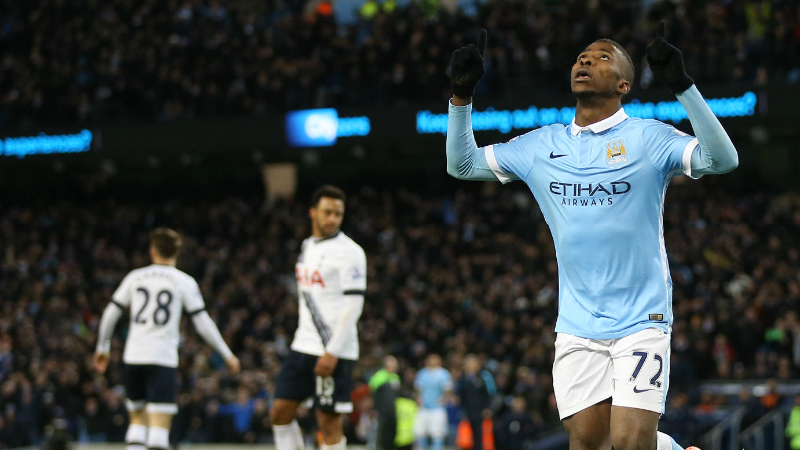 The best form of revenge is success and despite the disappointments, success is still well within City’s grasp. Dedicated to the memory of true blue Craig Tarry and the members of Viola Beach after their tragic accident in Sweden at the weekend. Let's not forget Clottedberk sent off Craig Bellamy for diving, when he was clearly fouled, and made inappropriate remarks about him to city staff. Obviously a maverick with a personal agenda! It's not as if he has previous with MCFC over many years is it? People always point to the 6-1 at Old Trafford but we were THAT good that no referee could deny us our victory. Think we have all had our say on the abysmal Clattenberk, but he wasn't alone in our demise. Sergio 'messed up' a couple of decent chances and Ya Ya who I thought had a decent game gave the ball away for Spurs second goal. Am with you, David, on both Bon Jovi and Keeping the Faith but it will need that extra 25-30% in all games to get the rewards that the early season deserved. Troubling news, which I have still to confirm but incredible if true...Clattenburg scheduled to ref Chelsea v City on Sunday. Surely the FA aren't that stupid or provocative? Sorry, of course they are! The world & his wife know Clattenburg was wrong he knows by now he was wrong, but what gets me is nothing will happen never does. Someone at FA will say Mark you got that wrong to which he will of replied looks like it & that's it forgotten that's what annoys me. He is such an arrogant man he probably doesn't believe he's wrong. Once again we were slow out of the blocks injury's beginning to bite don't know but I fear the season is imploding on us. Just hope Vinny being back can turn things around for us. Next up Chelsea is it going to be a weakened side if so that's another trophy we can kiss goodbye. Be glad when this season ends worst than last season. MP should of gone in the summer along with some of the players. Agree Dave after the season we have had 3rd will do. 28th December 2006 - ball cleared off the line by a sheff utd player from a Micah Richards header (Clattenburke the ref) no penalty, and after half time he told the offending utd player that he'd been lucky not to be sent off. I presume with his hand(s) ;-) This referee has a long list of previous 'offences' - sorry innocent errors - that he's perpetrated against City. Strange that, isn't it? Must be pure coincidence.